Be the first to share your favorite memory, photo or story of Ann Price. This memorial page is dedicated for family, friends and future generations to celebrate the life of their loved one. 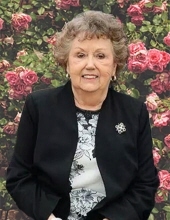 Jesse Ann Price Graham Lee, 84, of Mt.Olive passed away peacefully, surrounded by her family on Saturday, April 6, 2019 at Kitty Askins Hospice Center. Ann was born in Wayne County, October 25, 1934, to the late Jesse Katherine and Herbert Parker Price. Ann was preceded in death by her first husband, Julius Hansel “Teeny” Graham, and by her twin grandsons, Jason and Jay Lane. She was also preceded in death by her sisters, Voldie Ladd, Dannie Mae Gwaltney, and Peggy Weeks and by brothers, Herbert Price Jr., Earl Price, and Bobby Price. The family will receive friends Tuesday, April 9th from 12:30-1:45pm at Mount Olive First PH Church. A service to celebrate Ann’s life will be held at 2:00pm, also at the Mount Olive First PH Church, with the Rev. Jeff Dail, Rev. Bill Rose, and Dr. Larry Withrow officiating, followed by graveside service and burial in Wayne Memorial Park. Serving the Lord and taking care of her family were the driving forces in Ann’s life. She truly loved doting on her grandchildren and great grandchildren. She was her family’s greatest cheerleader and supported them in all their endeavors. Ann’s table was the heart of her home. It was there that the family gathered for home cooked meals and joyous times of fellowship. When she prepared meals for the family, she made sure to have all of their favorite dishes. Ann loved a good fish fry with fresh spots and sea mullets. With her family at the forefront of all she did, she remembered everyone’s birthday and celebrated with a special home cooked birthday dinner. To send flowers or a remembrance gift to the family of Ann Price Graham Lee, please visit our Tribute Store. "Email Address" would like to share the life celebration of Ann Price Graham Lee. Click on the "link" to go to share a favorite memory or leave a condolence message for the family.